Can’t decide where you want to work after graduation? Working for a corporation or a startup? Students are often in two minds about work conditions in both kinds of organization that meet their dreams. It is true that working in a corporation offers stability, but complex organizational structures and bureaucracy. Meanwhile, working in a startup company offers flexibility with huge opportunities of learning and working experiences as well as contributing to company’s missions accomplishment. Which one suits your character? Along with technological and economic advances, nowadays more of the millennial generation set up and work in startup companies, or more familiarly known as simply startups. For those who don’t really know what a startup is, several people has defined startup as a newly built business which stands in its early research and development phase to find a more appropriate market. The term “startup” itself gained international popularity by the late 1990 when many online firms (dot coms) were springing and at the end of the day, many of these dot com firms went broke and therefore the phenomenon was widely known as dot com bubbles. 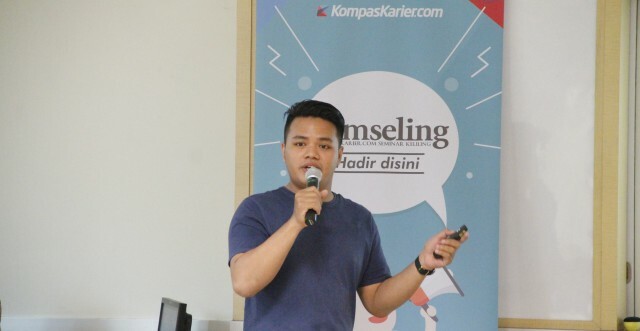 Despite being in its early development phase, many of the millennial generation choose to work in a startup after graduating college, some of them have worked eventhough they are still studying in college, for instance Yoshka Adrianto, Dealoka Jakarta Area Sales Manager, one of the many Jakarta-based startup firms. Yoshka is still sitting on his final semesters in a Jakarta-based private university, but he has started working in a startup firm since his sixth semester. Yoshka decided to work in a startup for the flexibility of it. “Working in a startup does not prerequire a college degree. No need of certificate. 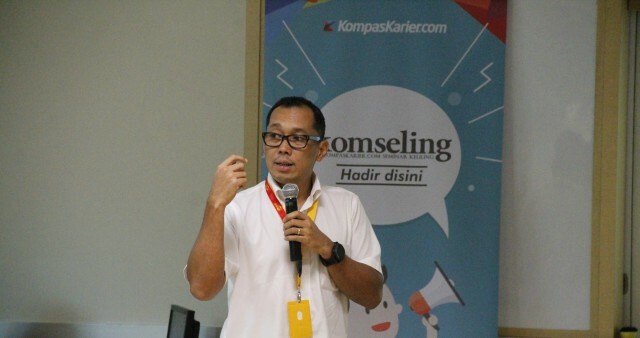 But, what a startup looks for is somebody’s potentials and work competences,” conveyed Yoshka on occasion of Komseling, a seminar for career preparation initiated by KompasKarir.com, StudentJobs.com, and Binus International on Wednesday (23/3) in JWC Senayan. Yoshka Adrianto, Dealoka Jakarta Area Sales Manager, is still sitting on his final semesters in a Jakarta-based private university, but he has started working in a startup firm since his sixth semester. In Yoshka’s opinion, a startup’s working patterns are different from a corporation’s wherein the corporation’s structure is rigid, while a startup’s structure is simple, characterized with compact teams, and flexible. “Working in a startup does not require filling presence list. What matters is that you finish punctually,” stated Yoshka whi admitted joining a startup firm to stay true to his passion. Yoshka explained a number of typical features and advantages of working in a startup. Firstly, for him working in a startup keeps a potential of making impacts because someone joins the firm since the beginning with certain missions so that he or she can contribute to the firm’s future progresses and more to society. Secondly, working in a startup means that someone can learn much more because office politics rarely takes over. Thirdly, working in a startup allows someone to build close relationship within a passionate team which is in accordance with the firm’s goals. Fourthly, startup is an organization that practise meritocracy so that talents are cherished according to their performance based on simple structure and bureaucracy, therefore contradictions are minimized. Fifthly, startup is a medium that allows someone to gather and achieve certain missions that meet his or her personal missions. Agreeing with Yoshka, Indosat Ooredoo Division Head e-Commerce Carlos Karokaro conveyed that corporations are huge organizaions having rigid structures. Bureaucracy consists in very long lanes. However, in a digital era like this, when industries are transforming, corporations commit various innovations too to adapt with changing technological environment and consumer behaviour. Innovations are taken care by ad hoc teams which are responsible for certain innovative projects or new subsidiaries. Carlos also shared his own career experience as an communication and telecommunication information technology practitioner. “The zest and typical features of startup are also shared in corporations, where innovations are done by forming new and compact teams consisting of expert people. We also do trial and error,” explained Carlos. However, in Carlos’ opinion, what matters most to students and other professionals is that building up a career, whether in corporations or startups, should mean making yourself an asset, not liabilities. “Also work hard, try something new, and help other colleagues,” concluded Carlos.